Descending into Cancun is always a treat; the sea is a blue color, as beautiful as anywhere in the northern hemisphere. 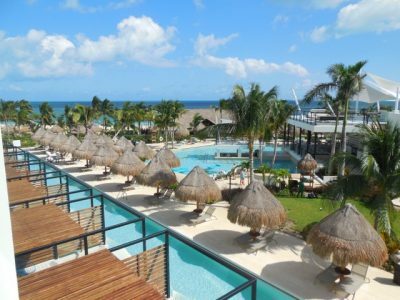 Within the almost 2 million square kilometers of Mexico, I discovered two spectacular resort gems named Excellence and Finest. 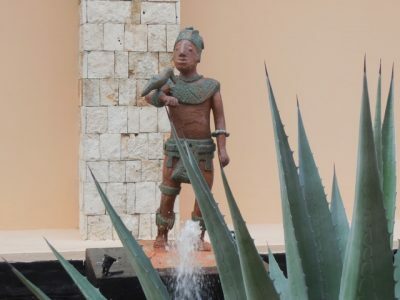 The Excellence Riviera Cancun Resort and Spa was my first stop. After a short drive from the airport, I arrived and was met by staff members handing me a cool, fragrant hand towel and a cold drink. Nice start! The all-suite property is a stucco, tile and marble palace. Its public areas, landscaping, outdoor art, plus the comfortable, well appointed rooms are all part of a recent multi-million dollar renovation. I’m a big fan of the all-inclusive concept. I soon realized that the adults only Excellence has raised the bar for the competitions’ food and customer service. In the suite, a shelf was lined with bottles of premium brands of alcohol. The refrigerator was stocked with water, soda, candy bars and cookies. All-inclusive = no extra charge for the goodies. The room was luxurious; jetted whirlpool tub, large marble shower, flat screen TV, free Wi-Fi, safe, plenty of outlets for electronics and a private balcony overlooking the property and the Caribbean. One of the most unique amenities was free calls to the USA and Canada. There is an hourly schedule of activities, ranging from archery to a daily hold ‘em tournament. There are six pools, a beautiful beach, nine restaurants (no reservations needed), 24-hour room service, the fabulous Miilé spa, fitness room, nightly entertainment and 17 bars/lounges. I was impressed with the outstanding quality of the food. Agave, Flavor Market and The Grill all featured attentive service, extensive and creative menu offerings and beautifully crafted desserts. Heading north, Finest Playa Mujeres was my next destination. Owned and managed by the same Spanish company as Excellence, there was a common commitment to food, service and amenities in an all-inclusive, luxury environment. Where Excellence Riviera Cancun featured a modern version of classic Mexican architecture, Finest was sleek and contemporary. The other major difference…children are welcome. There are spacious family suites featuring a connecting room for kids. Additionally, there are camps for ages 3-6, 7-11 and 12-15 that include their own events, pool and playground. The activities for adults range from tennis and Spanish lessons to Yoga and Zumba, with an hourly schedule that keeps you as busy as you desire. And, don’t forget the pristine beach. ONE Spa is a sanctuary of quiet, relaxation and wellness. My favorite treatment was the 50 minute One Aqua that leads you through 17 water stations, with a head, back and shoulder massage finale. Note: daily spa specials are offered. 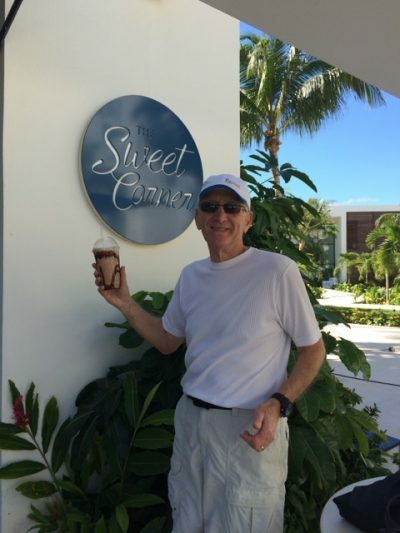 My real favorite was The Sweet Corner’s frappuccino style drinks and exotic ice cream flavors, e.g., banana/cinnamon and mojito. The Market Kitchen, Tinto & Tapas, Le Petit Plaisir and the Lobster House, in addition to the other restaurants mentioned at Excellence, served the best food I’ve experienced at an all-inclusive resort. Both Excellence and Finest have a strong commitment to being green. They impressed me with their attention to guests’ needs at all levels of the operation. An example is, rather than pointing when asked for directions to a restaurant, the staff accompanies you there. There’s no question that a Five Star experience is delivered. TripAdvisor and the many travel awards for both resorts attest to that. Excellence & Finest – Aptly Named! For further information on both, logon to www.ExcellenceResorts.com. Many thanks to the various websites for information, photos, etc.